Wow!!! 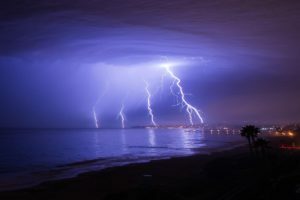 I woke up to some WILD weather here this morning- one of the most intense thunder storms we have had in Southern California in many, many years (Check out the photo below)… Or perhaps it just seems that way as rain has been such a rarity here as of late. Either way, I couldn’t help but nudge my boys out of bed an hour early to just sit & watch natures amazing fireworks. It was a beautiful predawn morning, just sipping on coffee and sitting in the dark by the picture windows with them. “Oooohs” and “Ahhhhhs” and giggles when a particularly loud clap of thunder startled squeals from us all and set off car alarms near & wide. These are the kind of moments I cherish with these quickly growing kiddos, the special ones that make long lasting memories. Halloween, now just a week away, is one of those special times. We all have memories of costumes from the past, traversing neighborhoods with friends & family on trick-or-treating expeditions, and of course, time honored family traditions. 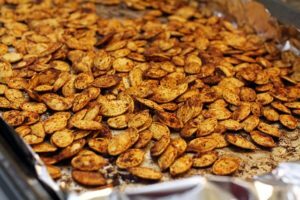 If there was one thing I could always count on, it was the roasted pumpkin seeds! My mother would gather all the seeds when we carved our Jack-O-Lanterns, carefully separate & wash them, and then toast them in the oven until golden. The aroma of nutty browned butter filled the house and I would burn my fingers & tongue on them straight out of the oven because I just could not wait. It is a tradition I have carried on with my boys, changing them up with varied spices for my own treats, but nothing beats the original… I only wish pumpkin season lasted longer so we could enjoy them more often! It took me a few tries to get my seeds to that perfect golden brown my mom always achieves, but I finally got it down and thought I would pass my recipe along. 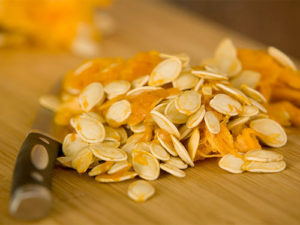 Roasted pumpkin seeds make a great snack this time of year, perfect for game day, after dinner treats, or for the road. And they not only taste great, they are chock full of healthy goodness too. They are little protein bombs, boasting nearly 9 grams of protein in cup sized serving. The fiber is a great bonus too, and their calories come predominantly from the healthy fats that many of us don’t get enough of, plus kickers of magnesium and potassium. That same cup of seeds also contains a full daily dose of zinc, helping to bolster your immune system during this general cold & flu season. And don’t forget their anti-oxidant capabilities… All around, these seeds are little health zingers you can feel good about enjoying. So when you clean out those pumpkins this year, don’t toss the goodness found inside. Roast up a family favorite tradition of your own, and get your whole family nourished! OPTIONAL: Add additional spices to the butter mixture. Be creative and go with the flavors you love! Preheat oven to 350 degrees. Separate the seeds as you clean your pumpkin. Wash the seeds well and pat them dry with a paper towel. Leave the seeds to dry for about 10 minutes while you prepare your spread. Melt butter in saucepan or microwave. Add desired spices and salt. Completely cover a cookie sheet with aluminum foil and spread the seeds out in a single layer. Pour or brush butter/spice mixture over the seeds evenly. Place the cookie sheet on the middle rack of your oven. The seeds will begin to brown after 20-30 minutes. Once they achieve a golden brown complexion they are done. Cool & enjoy!